The centre is located in the charming town of Inverurie and is composed of eight offices, ranging from 155 sqft up to 521 sqft. The centre offers an all inclusive rate, which is comprised of rent, utilities, maintenance, insurance, waste collection and car parking. The centre also has a number of shops close by, with a Morrisons supermarket just seven minutes walk. The town's train station also offers direct access to both Glasgow and Edinburgh. Based on the outskirts of Inverurie, this centre offers fantastic fully serviced office space. 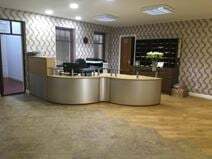 The space has a manned reception and the friendly on-site team are always happy to help with any administrative services or clerical support. There is ample parking at the site and dedicated meeting rooms. The rural location does not make the centre hard to access, with a bus stop just a five-minute walk and the A96 less than a one-minute drive.